Thousands of unknown activists have risked their lives to fight against extremism and violence. Daniel Adamson interviews some of them. But she was not happy for long. The Islamist group – starting to call itself ISIS – moved into the city. Many of the revolutionaries in Raqqa left. It was too dangerous for the revolutionaries who stayed to say anything. But Nofal decided to tell the Islamists what she thought. Every day for more than two months she stood alone outside ISIS headquarters in Raqqa with a different poster she had made (see picture). Her banners said what was wrong about ISIS eg. ‘Don’t talk so much about your religion, show us your religion with your good works.’ ‘Good people started our revolution, but thieves are stealing it.’ And : ‘ISIS = Assad’. In October 2013, Nofal wrote on a poster about how terrible it was that ISIS had burnt two Christian churches in Raqqa. ISIS militants destroyed the poster and shot at Nofal and her sister as they ran down the street. Days later, Nofal escaped across the border into Turkey. She is now a refugee in Holland. In 2014 those fighters, who now called themselves ISIS, took control of Raqqa. Abu Mohammed began to see public killings in the streets. In April 2014, with five other friends, he started a website to tell others about how terrible these jihadists were. They now controlled his town. About a month after the website started, ISIS killed one of the six people who started it. 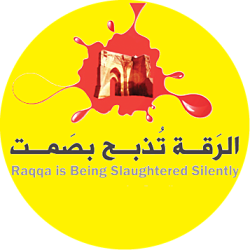 The site – Raqqa is Being Slaughtered Silently – now has 25 people working for it. It gives very important information to journalists and analysts all over the world. The people who run it are all between 20 and 30 years old. Four are women. Most live with their parents. Their parents do not know their children are activists. They meet only online and do not know each other. This is so they couldn’t tell ISIS about the others if they are tortured. Abu Mohamed is not the activist’s real name. In April 2015, Islamist militants put petrol on this piano and set it on fire. It was Ayham Ahmed’s piano. 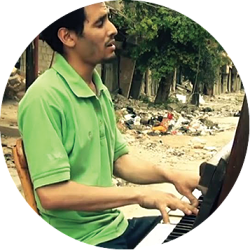 He is a 28-year-old musician, born in Yarmouk. This is an area of southern Damascus with many people. It grew from a Palestinian refugee camp set up in the 1950s. For the past three years, Yarmouk has been under siege (surrounded, cut off and under attack). Between August and December 2013, nothing could come in or out of the city. Many people were killed by bombs and guns. And more than 100 people died of starvation and disease. Ayham began playing when he was six. He studied with many Syrian and Russian teachers at the Arab Institute of Music in Damascus. His favourite composer is Rachmaninov. After the Islamists took control of the camp in April, Ayham’s music has put his life in danger. ‘The Islamists do not allow music,’ he says. 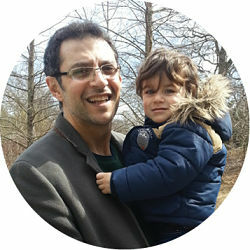 Ayham has two children, Ahmed and Kenan. They were born under siege. He is desperate to take them to safety. But the government had other plans. The water and electricity were cut off in the whole region. No food was allowed in. The Syrian army bombed the people every day. ‘They were trying to bomb the hospitals,’ says Majed. Before the war he was a dentist. Now, he was a volunteer doctor and was organising supplies to Ghouta’s hospitals. The medical teams were well organized – but they were not prepared. On 21 August 2013, rockets bombed an area with many people – with the chemical sarin. Majed was at his hospital when the bodies started to come in. ‘Kids and women arrived in their sleeping clothes. We could not believe they were dead. We’re used to blood, but there was no blood. They were sleeping.’ It was the worst chemical attack since the Iran-Iraq war. Majed thinks more than 1,000 people were killed that night. 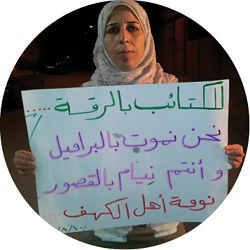 NOW READ THE ORIGINAL: http://newint.org/features/2015/09/01/syrian-activists-risk-their-lives/ (This article has been simplified so the words, text structure and quotes may have been changed). This page was last edited on 20 September 2015, at 14:19.